Worktop repair chip to front edge. People often think that a worktop is indestructible, we know from experience that they are not. 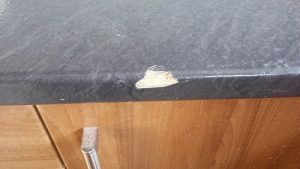 worktops can be damaged very easily by dropping things chipping or denting the surface or placing a hot pan down and burning through the laminate coursing blisters and scorch marks. Namco’s expert technicians can repair damage to any worktop surface with invisible results. Even water damaged blown worktop joint can be repaired and refurbished. Worktop repair chip to front edge. 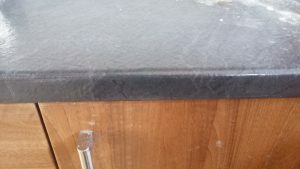 We dont only repair and refurbish damaged Worktop repair chip to front edge, Namco Refurbs can repair and refurbish any hard surface back to a newly installed look. Take a look at our repair gallery for many before and after repair picture, you never know you may even see a similar if not the same item that you have damaged. 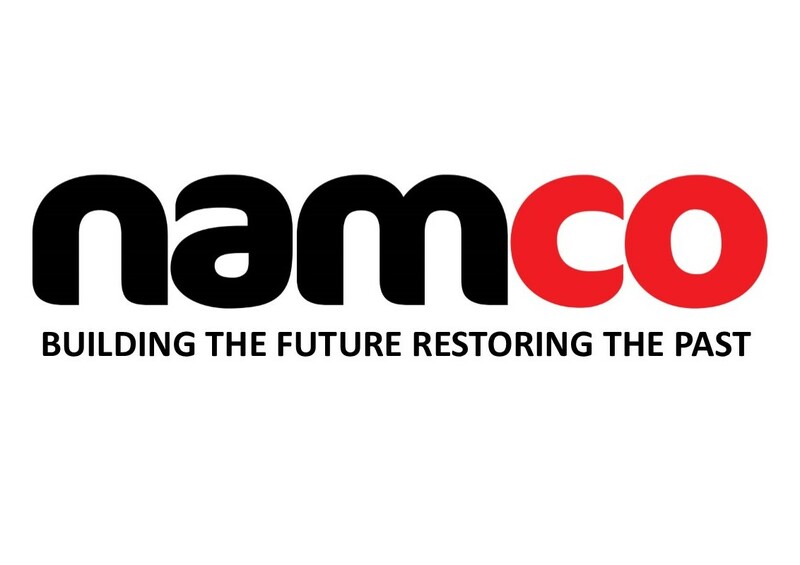 Namco Refurbs covers the whole of the UK and Ireland. To book one of our technicians in for a repair please give us a call or email or even a message through one of our social media forums. Not only do we perform Damaged Worktop repair chip to front edge, we can repair any hard surface in and around your property WITHOUT THE NEED TO REPLACE. Check out all our services including worktop repair Manchester, Veneer door repairs Manchester, Bath and sink repair Manchester. Worktop repair chip to front edge Manchester. This really all depends on how badly damaged the surface is and how many repairs there are to do. Smaller repairs generally take up to an hour with the repaired surface ready to use again shortly after. For more sever repairs say for instance a WATER DAMAGED WORKTOP JOINT REPAIR, this could take half a day to complete but will be ready to use straight after. When compared to replacing the item you not only save time and money but also the environment. Looking to book a Technician ? Our technicians have been performing Damaged Worktop repair chip to front edge for customers across Europe for over 14 years. With invisible results we are the name to trust when you need us most. With over twenty 5 star reviews on Google and Facebook we are the name to trust when you need us most.